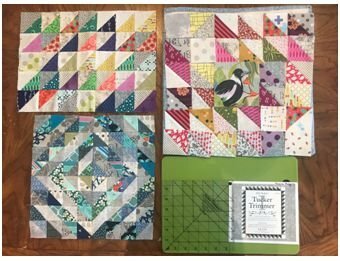 The Tucker Trimmer tool was designed to help quilters quickly and easily trim down units that are made with triangles: half square triangles (HST), quarter square triangle squares (hourglass units), and combination units. In this class I will demonstrate and you all can practice some of the basic units you can make with this tool. Then after we will learn how to make 8 HST at once and which are used in Long Time Gone. Try before you buy: we will have a few tools available to rent for $5, which will then be taken off the cost if you decide to buy that day.